Exxon Seeks Waiver From US Sanctions On Russia - Joe.My.God. Exxon Mobil has reportedly applied to the US Treasury Department for a waiver from US sanctions on Russia, which – if granted – would mean that it can resume its joint venture with Russian-state owned oil giant PAO Rosneft. Citing people familiar with the matter, the Wall Street Journal reported that Exxon had been seeking US permission to drill with Rosneft in areas banned by sanctions. According to one of the people, the company doubled down on efforts for approval in March, shortly after Rex Tillerson, its most recent chief executive, became US Secretary of State. Reuters reported that Exxon had declined to comment on the story. The company was not immediately available for comment when contacted by The Independent. Any waiver request would be the subject of very close scrutiny by members of Congress as they are seeking to intensify sanctions on Russia after the US said the country used cyber attacks to interfere with the presidential election last year. 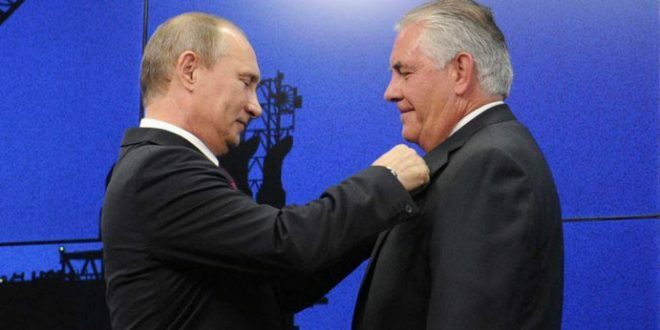 In 2013, Vladmir Putin personally awarded Rexxon Tillerson with Russia’s Medal Of Friendship.